This is part three in a series on Internet Savings. Previous articles included an overview and freebies. 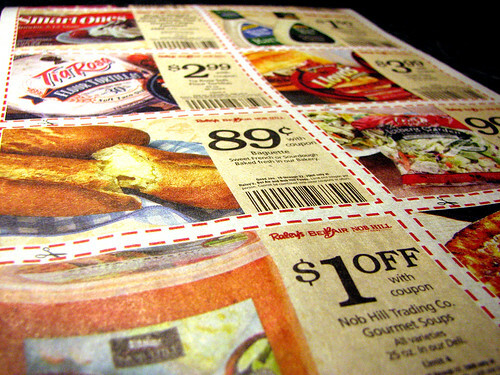 By combining sale prices with coupons it is possible to save a great deal on groceries and household items. It would be difficult for the average person to be able to match coupons to sale items at all the various grocery and drug stores. That where many of the blogs featured here come in. These bloggers will identify the best sale items at a particular store this week. If there’s a coupon that makes it better, they’ll tell you the date published or include a link to an online coupon. Be aware you’ll learn a whole new language! Chief Family Officer publishes match-ups for my main grocery store, Ralph’s, which is how I found this site. Kathy also covers deals for the three main drugstores which are CVS, Rite-Aid and Walgreen’s. One unique thing about this site is that she regularly publishes product recalls and best Amazon deals. Faithful Provisions is a good all-around savings site. In addition to grocery and drug store deals this site publishes giveaways and freebies. Kelly even hosts a coupon database! If your grocery store is Kroger, check out this site. Common Sense With Money. Mercedes includes Wal-Mart, Target and K-Mart along with grocery and drug store deals. There are guides to shopping at the stores to maximize savings. Stretching a Buckis something we all want to do. Marcy provides many of the same match-ups at the other sites as well as freebies. A favorite feature is the Target gift card deals which for some reason I can never find on my own. Saving with Shellie posts printable coupon round-ups which is helpful for those that don’t get the newspaper. She also has a web page on frugal living including a series on holidays savings. This list is by no means exclusive as there are many more excellent blogs with much of the same material. Check these out to see if they cover the stores you shop at. If not, they all have links to other blogs that may better suit your shopping needs. Use the power of the Internet to save, and make, money! What sites do you use to find the best store deals? .-= Jersey MomÂ´s last blog ..Money Schemes of a Kindergartener =-. Thanks for that recommendation. I’ll add it to my reader.